As my time here draws closer to the end, I decided that I needed a good night out with one of my friends. And thus was planned the random about town adventure. 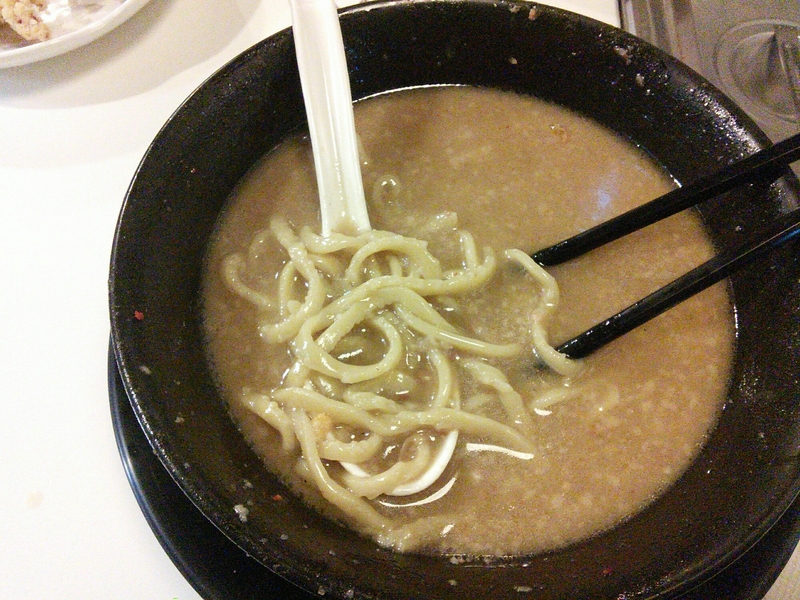 It started with going back to that Ramen place for some awesome, awesome noodles. I was really hungry and those noodles hit the perfect spot! We then walked around the area, to work off that full feeling and did some casual shopping. 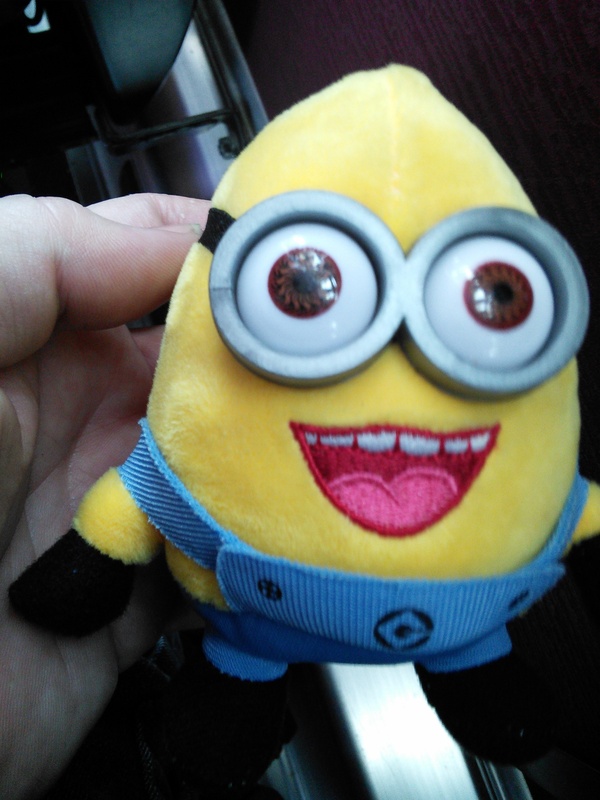 At one point I saw a game machine that had Minions in it. Had to play it! I plunked in 5000won and got 12 tries. I got so damned close many times but ultimately didn’t get one. My friend also tried and got one on the first shot. Technically I set of up for him. This was one of those “shovel” types. See that metal plate on the back, left of the pic? That would move back and forth. So essentially you had to pile minions in front of it and eventually they would get pushed off the ledge. 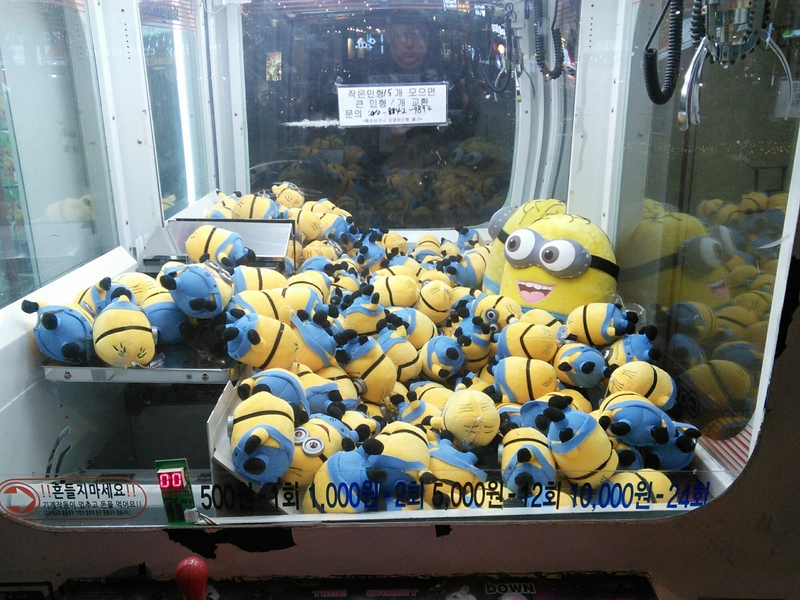 He had more tries left then proceeded to get three more minions to fall off after! By this point we had a small crowd of Koreans watching us and we all cheered. He gave all three to those watching. 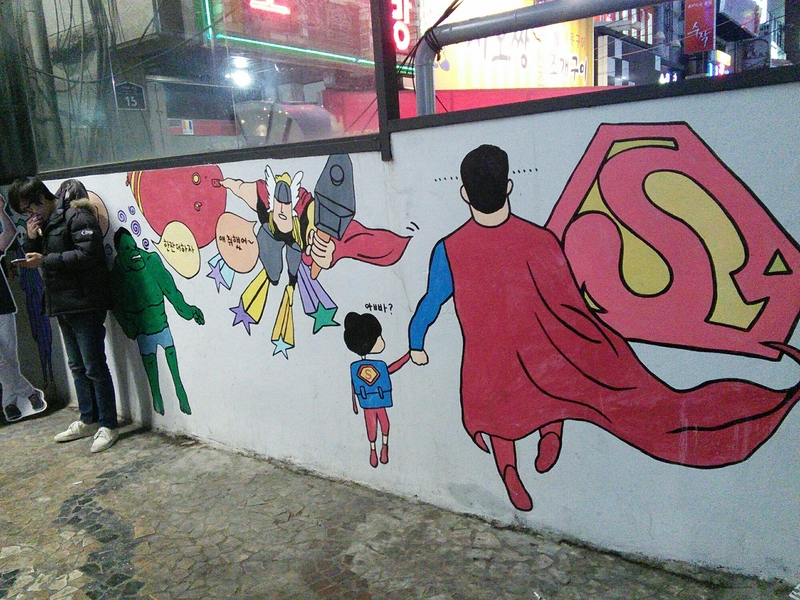 Totally worth the 10,000won we spent together. We continued our adventure. I wanted to get a new hat, looked in a bunch of places, only saw one that had the type I was looking for, she wouldn’t haggle at all! My first hat cost me 11,000won, my second 15,000 but there was no way I was going to pay 20,000 for the same thing! And who the hell doesn’t haggle here??? Meh, no skin of my back, we left and continued on with our night. Having had enough of Hongdae, we got into a taxi and hit Sincheon. Sincheon had recently shut down a street and turned it into a pedestrian walking path. I love this setup. It promotes more business and more people to come to the area. Also, is generally more pleasant to hang out around and enjoy the night. We again wandered the area, looking for a bar my friend had been to before but we could not find it. 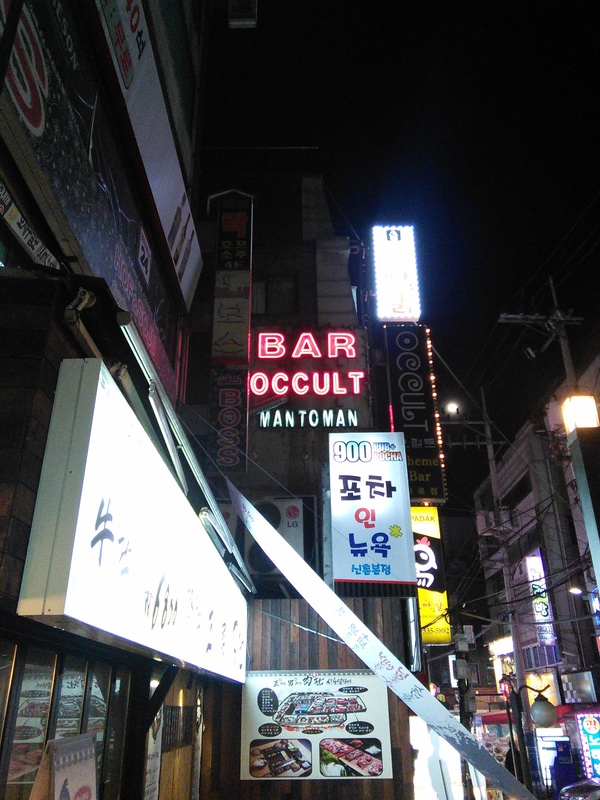 So we settled on a place called Occult. Couldn’t resist a place with a name like that in Korea! The place was pretty much dead. Just one other patron and us. The Korean waitress , who spoke really good English, was cool. We chatted with her for a bit bit since the place has an upstairs and she had work to do behind the bar, she asked if we wanted to move over to the bar to keep talking. We said sure and moved on over. So it was the former owner who did the tarot readings so they have stopped. Hence the name. We sat there for about two hours I think. Had a few drinks (never had Amaretto & Coke before…. Tasted kinda like Dr Pepper!) and then we decided to move on. 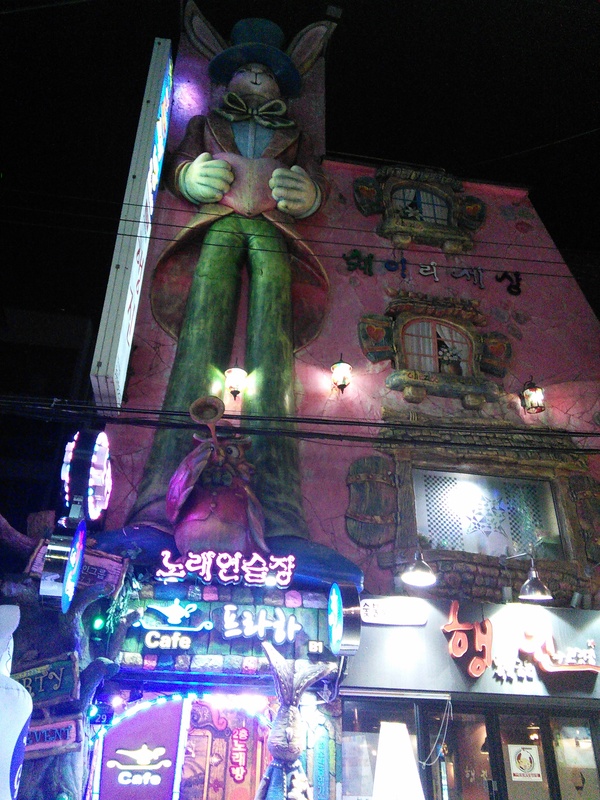 We were going to go to a casino but when we realised it was midnight and the casino was quite a ways away, we decided to hit Sincheon area instead. Only one subway stop away but we took a taxi. Just quicker and not really that much more on cost. Subway would have cost us 2200won, taxi was 3000won. We eventually settled on a place called Blue Monkey. The steps going down were concerning. There were solid metal steps and I’m thinking that knowing how drunk Koreans can get (indeed after seeing two of them passed out in front of a bar literally sleeping on the ground, their friends standing around while police officers tried to wake them up, unsuccessfully) these steps are pretty much a hazard. 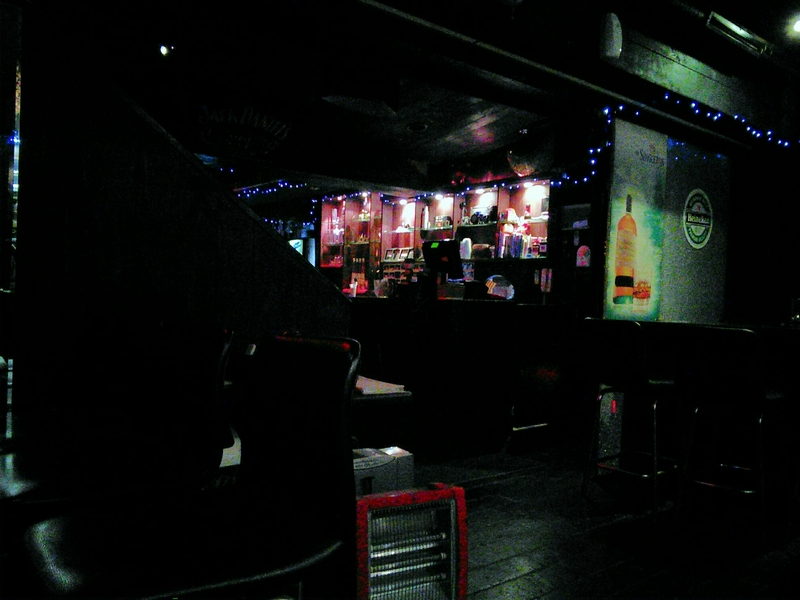 The place was kinda dark but one section has a little slide in it. While amusing, again I questioned the sanity of the owner and how lucky these people are that as far as I know, there aren’t any laws regarding safety rules and such compared to back home. So another cute waitresses showed us to a table, we sat down, ordered some drinks and cheap cheese nachos while watching music videos on the screens and discussed deep thoughts of the universe. 3am rolled around and we called it a night. Didn’t feel like staying up till 6am when the subway starts again, would have been a total waste of that hotel room I paid for too. So back to a taxi and we ended a good night out. I grabbed a shower and went to sleep. This was a great night out. The local Lotteria (Burger King copycat) had come out with a new and disturbing burger…… Yeesh. 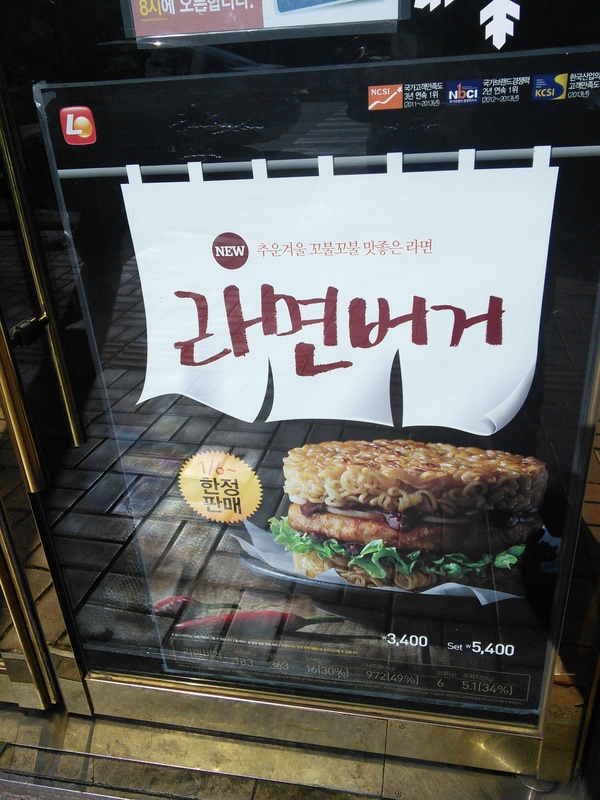 Author DragonDonPosted on January 10, 2015 Categories ContentTags food, Korea, Ramen, Ramien, South Korea3 Comments on Introducing the Ramien Burger! We’ve all heard of them. Ramen/Ramien/Mr Noodles. We all think “dirt cheap Chinese food”. So I was quite hesitant when my friend suggested a Ramen noodle place to eat. Boy was I wrong!